We're thrilled that our new neighbor, the National Museum of African American History and Culture, will open its doors in September. To celebrate, we're opening a small display of photos in our Lower Level gallery bringing together photographs from two of the museum's Archives Center collections. 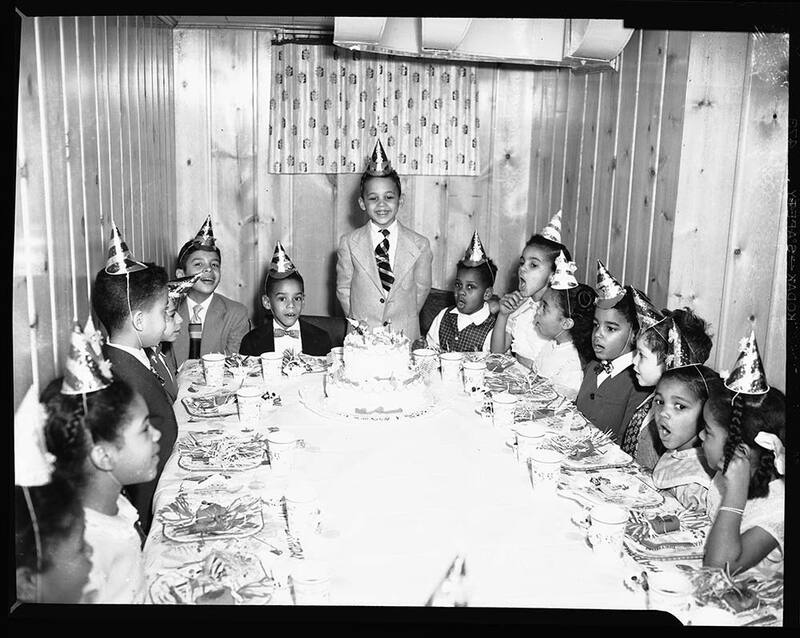 As described in our previous post, we need your help selecting which photos to feature in the display, titled Celebrating Our Memories, Celebrating Our Lives: Snapshots of African American Communities. Check out the photos below and cast your vote! If you like, you can add your own comments or memories sparked by a photo. We may use your contributions in the development of the display. If we use a comment in the show, we'll ask your permission and credit you appropriately. "I like looking at the background and the small details in a photograph. Here, the party atmosphere is juxtaposed with the somber setting, in what appears to be a basement. As I look at this, I think about the world that these children are growing up in—a segregated city and a segregated nation. I know that this photograph was taken in Washington, D.C., in 1949, two years after Jackie Robinson broke the color line in professional baseball and five years before the Brown v. Board of Education decision. I think about the fact that these children will likely be in their teens and twenties in the 1950s and 1960s, the generation of young people who would mobilize as part of the modern civil rights movement. "I look closely at the image on the post toward the right-hand side of the photograph, of the Capitol and the American flag, and I marvel at the parents and grandparents of these children, who believed in the promise of this nation even when they were denied full access to it. As I take in this image, I think about the many people who have believed in that promise and who work to ensure that the nation lives up to its ideals. And I think about my infant daughter. What will her birthday parties look like? What nation am I leaving for her?" "It is also imperative to spend some time noticing the differences to my own experience. There are a lot of little differences I notice right away. My birthday parties were never this fancy. I never in my life had a two-tier cake to celebrate my birthday! But there is one key difference: he was an African American child in segregated Washington, D.C., in 1954. While I may try to imagine it, I'll never know what that was like. If I could talk with Donald now, I'd ask him how he remembers the city in his youth. At that age, how had racial prejudice and segregation affected his life? Had he felt threatened or demeaned in the racialized spaces of D.C.? His proud smile, askew tie, and easy stance lead me to believe he felt safe and comfortable in this space. I'm glad he had a happy birthday, and I'm glad a photographer from the Scurlock Studio was there to document it." 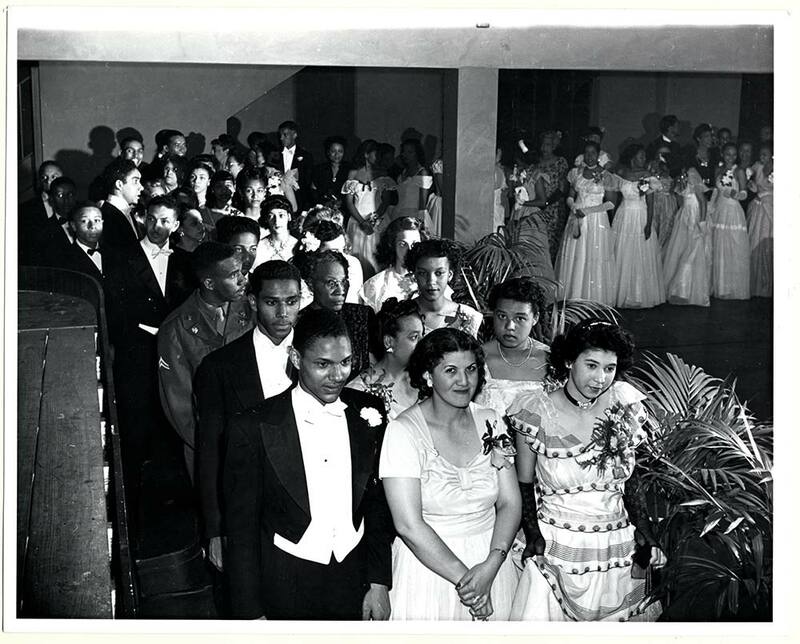 "As someone who studies youth culture, I was interested in this photograph for its potential to tell us more about African American cotillions, or debutante balls in the period after World War II. The photographer from the Scurlock Studio snapped this photo in 1949, freezing in time members of the Bachelor Benedict Club in Washington, D.C. 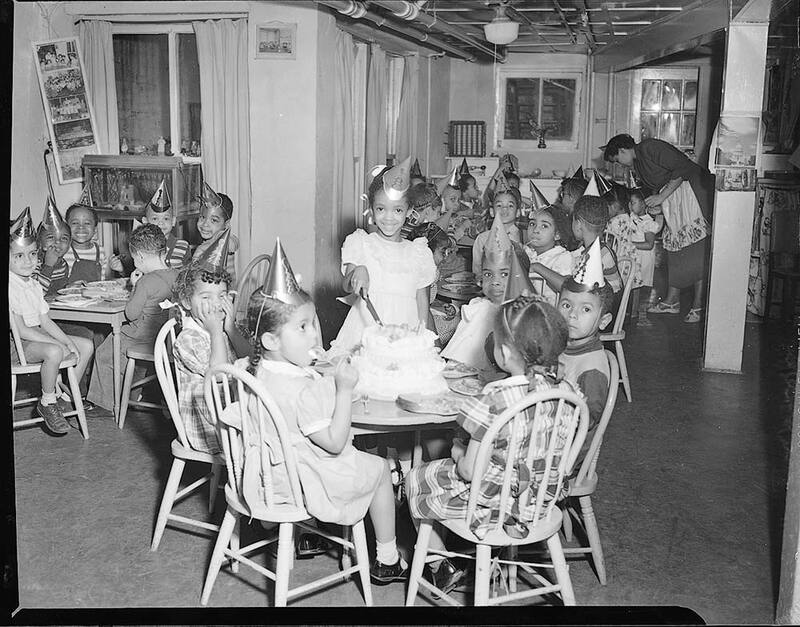 The club organized social events for the city's African American professional class. Each debutant has seemingly two escorts—a young man and an older woman. We can almost see everyone's face clearly. But what were their names? What did the ball mean to them? Where did they go and who did they become after the ball? If you choose this photo and it goes on the wall, we may learn the answers to some of these questions from those who see it and can share their stories." "This image, from our Archive Center's Fournet Drugstore Collection, is so fascinating because it holds so many stories. "In 1954, African American women were ineligible to apply for the national Miss America contest. 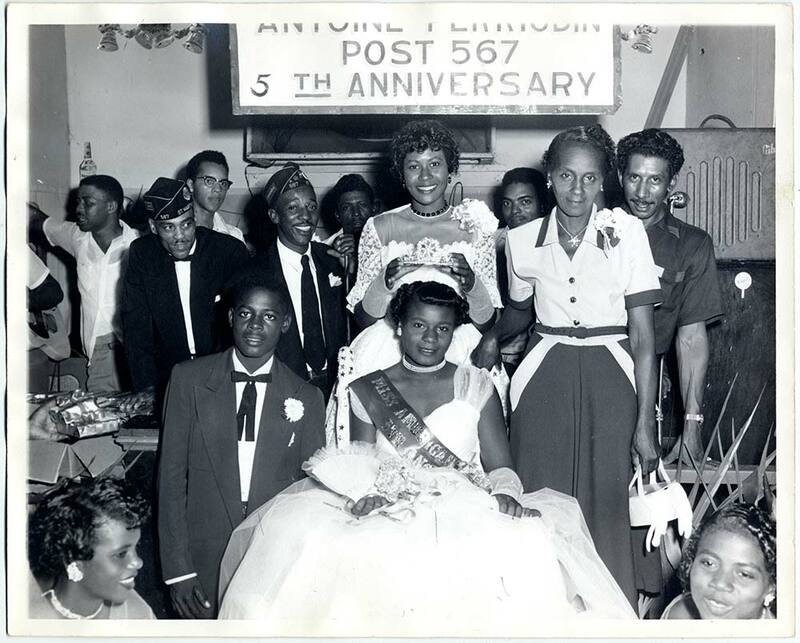 To celebrate its fifth anniversary, the American Legion Post 567 in St. Martinville, Louisiana, crowned its own Miss America. They did so in the Legion Hall, a place where many African Americans in the South felt free to gather. The smiling veterans had won a great victory a few years before. In 1948 (six years before this picture was taken) the Armed Forces had desegregated with President Harry Truman's Executive Order 9981. Likely the order was prompted by the Double V Campaign initiated by African Americans who insisted that America's victory over tyranny needed to take place on the home front as well as on the battlefield abroad. "African American newspapers, such as the Pittsburgh Courier, featured the Double V girl—attractive and talented African American women such as these—who actively supported the campaign. The civil rights movement continued the effort. After much protest, and with the advances of this movement, African American Vanessa Williams was crowned Miss America in 1983. The Many Voices, One Nation exhibition, opening in 2017, will include a section on the military, the desegregation effort, and the Double V Campaign." "Although Freedmen's Hospitals were established in the American South in the wake of the Civil War, most of these hospitals were short-lived. In Washington, D.C., however, dedicated physicians fought to keep the city's Freedmen's Hospital open and by 1894, the hospital had established a nursing program for African American women. 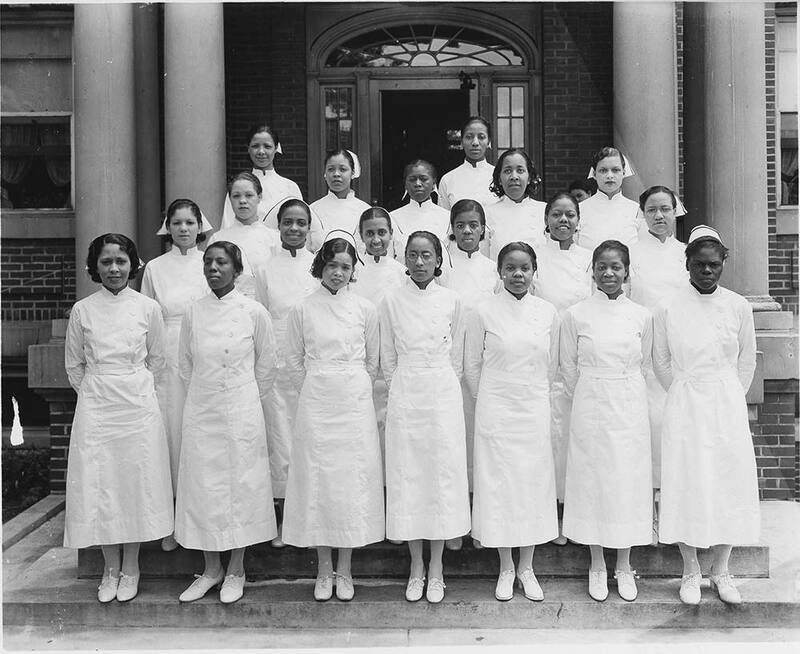 In 1923, just seven years before this class of nurses graduated and was photographed by the Scurlock Studio, the superintendent of the Freedmen's Hospital nursing school said that the demand for nurses trained at the hospital was such that the program was unable to keep up with the demand. Today, Freedman's Hospital—which was renamed Howard University Hospital—still trains nurses." "The work of historians is one of asking questions and finding answers, but you don't have to be a historian to 'do history.' An image like this sparks my curiosity, which leads to questions. Look at all of those determined faces. Who are they? Why are they gathered? The scene looks similar to graduation ceremonies I've seen, with people wearing caps and gowns, so starting there I look for more clues. The small group of scholars are wearing cloth 'hoods' around their necks that indicate they have been awarded master's degrees. The rest of the group are wearing suits, hats, dresses, and gloves, which give the impression this is a formal occasion. A graduation or other ceremony perhaps. 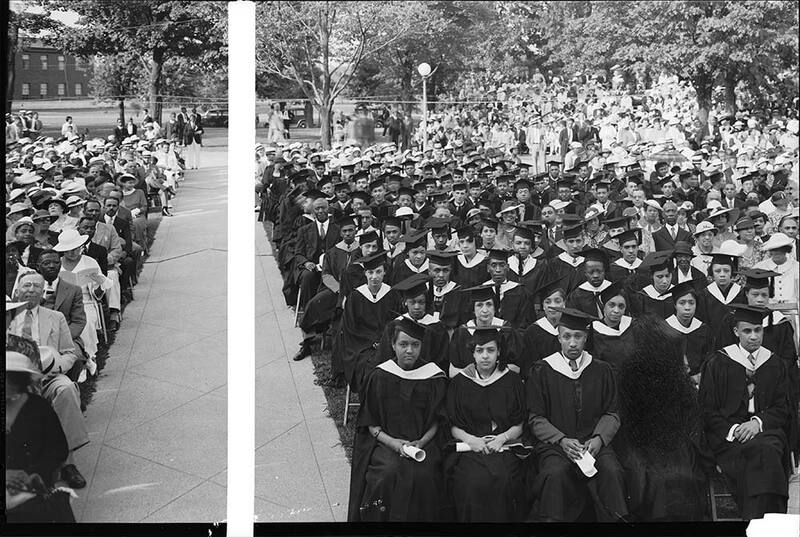 The photograph was taken by the Scurlock Studio in Washington, D.C., so it's likely related to Howard University, one of two historically black colleges/universities in the district, but when was the photograph taken? "My questions lead to looking even more closely at the image. There are a few cars in the background. After a quick Google image search, I find similar cars from many sources of information ranging from personal Tumblr pages to very reputable television networks. After choosing several trusted sources, I learn that the cars are likely from the 1930s. In 15 minutes, I've collected enough clues to begin investigating this frozen moment in time. Eventually, with visits to Howard University and other archives, I may be able to discover the individual stories behind each of these bright and determined faces. Learning their stories helps me better understand what it means to be American. Their journey is our journey." Voting closed on Friday, May 27 at midnight EDT. We'll announce the winning photos in June 2016. As any museum employee or volunteer will tell you, developing and designing exhibitions and displays is a complex process. We'll do our best to include every winning photo, within the limits of the laws of exhibition math and physics. If a photo doesn't fit on the wall, we promise to display it on our website instead. Thanks for understanding and being part of our team! Celebrating Our Memories, Celebrating Our Lives: Snapshots of African American Communities opens on Friday, September 9, 2016, and you can see it through Tuesday, December 27. Get involved with the National Museum of African American History and Culture to be part of the celebration. Erin Blasco is an education specialist in the New Media Department and Cassie Mancer is a project assistant for the Office of Project Management and Editorial Services.